Boker Orca Dive Knife: made from the same steel as jet engine ball bearings. The Boker Orca was designed to be the toughest possible utility knife for divers and combat swimmers. This German knife was tested by Germany's equivalent to the Navy SEALS, the GSG-9. They heartily approved of the knife, and it was considered for official adoption. Blade steel is X15T.N, the same steel used in the ball bearings of jet engines. Regarding this steel, my everyday work knife is a Boker Model 90 Badger, with a blade of the same steel. I have used it to cut foam glass insulation, fiberglass insulation, canvas, rope, cardboard, and a variety of other materials. I have also used it to scrape cork insulation off piping, and gaskets off of compressor valve plates and heads, and to open containers of cleaning chemicals. I also take it with me when I wind surf. The steel is so tough that there are only tiny scratches on the blade, and none of the salt water or chemical exposure has caused even one spot of corrosion. The blade takes a shaving edge with a few passes on a Spyderco sharpener, and holds it extremely well considering the abuse it gets. The blade of the Boker Orca is 5 1/4" long, and is coated with black titanium. The back of the blade has a section that is sharpened, so that it can be used for heavy chopping without having to abuse the main edge. The main edge has a slight re-curve, and cutting, slicing and slashing efficiency is enhanced with a combination of serrations and micro serrations. The handle is Hytrel, designed to fit the hand naturally and provide a secure grip. The sheath is made of durable POM, and is designed to allow quick access to the knife from a variety of tactical carry options. The Boker Orca was designed and built with the toughness and versatility to handle diving and field duty with ease. Since this page was written, this knife has gone out of production. 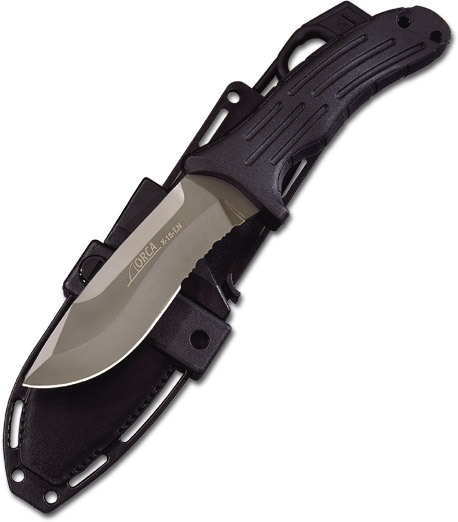 I'll leave the page as is, and this link to any Boker Orcas that might be available at Amazon.com. Return from Boker Orca to the German-Knife.com home page.